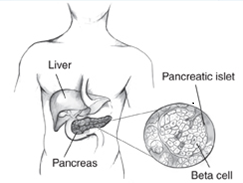 Diabetes is a metabolism disorder where the beta cells present in the islets of pancreas make insulin and release it into the blood. The condition occurs when the body is not able to make or use enough insulin. Liver Cirrhosis refers to the scarring of the liver tissue. It is a slowly progressing disease caused when live liver cells divide and multiply resulting in the cluster formation of liver cells. Liver Cirrhosis is the chronic stage of liver failure and at present can be treated by liver transplantation process. Coronary heart disease – It is a condition where the flow of oxygen-rich blood to the heart is blocked or interrupted due to fat buildup in the coronary arteries resulting in chest pain or heart attack. Stroke – A stroke is a medical condition resulting in interrupted blood supply to the brain causing brain cells to die thus brain damage and death of the patient. Peripheral arterial disease – This disease leads to blockage in the arteries to your limbs resulting in cramps in the legs, hips, calves etc. Aortic disease – Aortic Aneurysm is the common disease in which aorta becomes weak resulting in abdomen and chest pain. 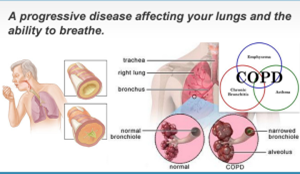 COPD is a lung impairment causing difficulty in breathing. It is caused due to smoking, polluted air, duct or chemicals. The symptoms of the disease include cough with mucus, fatigue, breathlessness, fatigue, Chest congestion, wheezing etc. Asthma refers to a conditions where air passage to the lungs is interrupted resulting in coughing, breath shortness, wheezing and chest congestion. At present it can be treated using certain medications though that can also prevent the symptoms instead treating the disease from the core. Obesity refers to the deposition of adipose tissue in excess amount. It puts individuals at risk for a lot of chronic health conditions which includes hypertension, imbalanced cholesterol level, diabetes, heart related diseases, gallstones, birth defects, miscarriages, asthma, and numerous cancers. Depression is the brain illness which may be caused due to genetic, environmental, emotional factors. It may also be caused due to medical illness or stress and thus affecting overall physical health.